Rumoxil capsules and oil are highly effective and powerful herbal supplements to protect joints and bones of the body from ill-effects of aging, poor nutrition, unhealthy lifestyle, after-effects of injuries, fractures and surgeries. These are very efficient protectors from progressive disorders like arthritis well known for causing joint stiffness, pain and immobility, and debilitating diseases like osteoporosis, fibromyalgia, etc. These supplements not only cure disorders which trouble bones and joints, and their endurance and strength considerably, but also improve endurance and mechanism to keep joints stronger and healthier. These supplements enhance health and endurance of entire musculoskeletal system and also nourish and energize muscles, ligaments and tendons which can cause joint stiffness, swelling and pain due to damages, weaknesses and fragility. Rumoxil capsules and oil in combination work as effective shield against all types of arthritic conditions and other disorders like anaemia, deficiencies, mal-absorption of nutrients, etc. Enhance joint health and mechanism by improving health of joint organs. Repair damaged cartilages and maintains joint lubrication. Increase bone density and flexibility by supplementation and promoting growth of bone tissues. Nourish, heal and energize muscles, ligaments and tendons of the joints to keep them mobile and healthy. Remove deficiencies of calcium and vital vitamins to prevent bone atrophy and weaknesses. Improve immunity to curb effects of auto-immune disorders and protect joints and bones. Improve nerve functions to promote better joint stability and prevent numbness in limbs. Curb pain and swellings; also treat tenderness, redness and warmth in joints effectively. Prevent excessive uric acid levels and dissolve uric acid crystals flowing in blood. Improve digestion and assimilation of nutrients. Effective remedy for treating sciatica, lumbago, frozen shoulder, neuralgic pains, bone disorders and bone infections. Diffuses swelling and relieves pain in a short time, and promotes joint movement. Treats joint stiffness, limited range of motion and morning sickness effectively. Enhance flow of blood and increases nutrition supply to muscles, ligaments and tendons. Helps in enhancing reach of immune system to treat infections. Improves nerve functions, removes numbness and treats disorders related to nerve weakness like fibromyalgia. Improves joint stability and endurance and removes debilities due to lack of nutrition. Heals damaged tissues and enhances repairing of damaged cartilages. Keeps synovial fluid free from infections and uric acid crystals. Rumoxil capsules possess herbs which are effective in enhancing joint mechanism and protecting them from damages caused by aging, lifestyle and diseases. 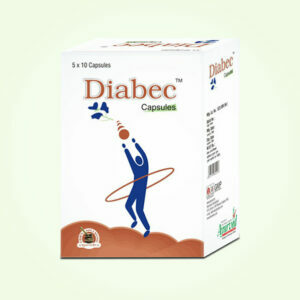 Herbal ingredients of these capsules are Rasna, Chobchini, Suranjan, Sonth, Nag Kesar, Kesar, Swarna Bang, Jaiphal, etc. Bone degeneration, arthritic conditions and disorders related to bones which lead to atrophy and brittleness damage cartilages and allow bones of joints to rub each other on movement. Infections in synovial fluid, which keeps cartilages soft and flexible, also cause joint stiffness and pain. Uric acid crystals damage cartilages and make joints stiff and painful. Rheumatoid arthritis damage cartilages, muscles, ligaments and tendons and make joints swelled and achy. Rumoxil capsules prevent all these condition by repairing and maintaining healthy cartilages, protecting bones from atrophy and degeneration, and enhancing immunity to curb infections and nullify effects of auto-immune disorder. Rumoxil capsules prevent tissue damage due to free-radicals by supplementing anti-oxidants and also delay tissue aging. These enhance tissue growth and also production of bone tissues to keep muscles, ligaments and tendons strong, heal damages and maintain healthy bones and joints. These supplement minerals and nutrients which are necessary for improving bone health and also promote secretion of hormones which metabolize nutrients and allow their easy absorption for enhance health and strength of entire musculoskeletal system of a person. These improve nervous system of the body and prevent joint instability and numbness in limbs due to nerve weakness and damage. Rumoxil oil is made after using oils of Dalchini, Gandhapurna, Buleylu, Tarpin, Kapoor, Gandhapatri, Ajwain and Long and Satt Pudina. This oil seeps through skin and diffuses swelling and curb pain in a short duration. It provides warmth to organs and relaxes nerves and muscles to promote movement. 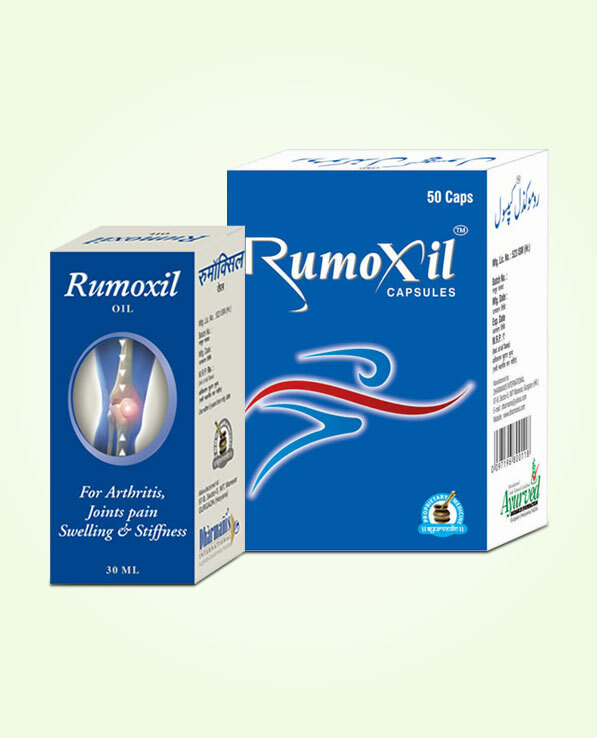 Rumoxil oil entices higher blood flow which works well for curing infections, increasing nutrition and repairing damaged cartilages and tissues of the joints. This oil treats redness and joint tenderness due to uric acid crystal deposition quite effectively. Rumoxil oil on regular use enhances joint strength and stability. It is very fast-acting supplement to relieve pains due to sciatica, cervical spondylitis, fibromyalgia, neuralgia, injuries, stress, over-use, etc. and promote movement. This oil on regular use keeps ill-effects of aging away and prevents troubles in prone individuals who are into strenuous lifestyle or are obese and weak. 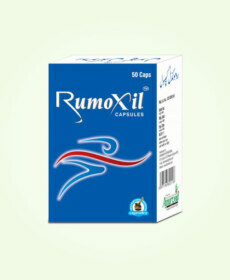 Rumoxil capsules and oil are easy to use. Consume one or two pills of Rumoxil every day twice after breakfast and dinner with water regularly for 3 to 4 months. Apply Rumoxil oil over troubling joint in sufficient quantity and massage till entire oil gets absorbed in the skin, repeat 2 to 3 times in a day. These are completely safe supplements which are free of side effects. I was diagnosed with high uric acid levels. This acid can damage joints and make them deformed. Before this problem could affect my joints I decided to take proper protection. I started using Rumoxil capsules and oil. I am now more active and agile than before and not a single episode of joint pain, inflammation or stiffness has occurred. My uric acid levels remain healthy and are not alarming anymore. I feel lot stronger and healthier after using these supplements and my muscular endurance is much higher now.